One question that always pops up in the forums and in conversations between drummers is, ‘How do I make money from playing the drums?’ Many of us play for fun but almost all of us would love the opportunity to do it for a living. One of the most ignored drumming skills is the ability to read. Far too many drummers by-pass it early on and often regret it later in life – especially when they miss out on learning and playing opportunities because they can’t do it. Reading drum rhythms and charts will, 1) Make your learning far easier, (because every drum book on the market has drum notation in it!) 2) Allow you to transcribe and memorize songs, and 3) Help to make you more employable. You could be the best player in the world but if your drums are out of tune your gonna sound like crap. Unfortunately, most drummers think tuning is a bit of a mystery so they never quite get the sound they’re after. 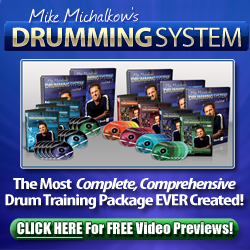 There will be times in your drumming life when things get tough – you have a hard time learning a particular beat, you practice but don’t seem to get any better, you can’t get any gigs. Whatever it is, it’s stressful, it leaves you feeling flat and undermines your love of the instrument.